Great taste 2017. Ready in 15 mins. Gluten free. No artificial colours, flavourings or preservatives. Suitable for vegetarians & vegans.One of the main components of Thai cuisine, rice vermicelli noodles are widely used in both hot and cold dishes. Highly versatile and naturally gluten free, they are made from a paste of rice flour and water that is steamed, formed, cut and then dried. 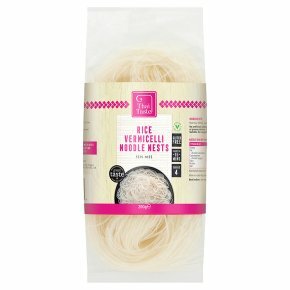 Our vermicelli noodles are ideal for soups, salads and stir fry's.
. Nutritionals based on contents, not the suggested recipe. Serve hot or cold. Try with Thai Taste Curry Meal Kits for a delicious meal solution - Ready in 15 minutes! Handy Tips Substitute prawns with diced chicken, tofu or chopped vegetables.